Camels Hump Rain Barrels began with a desire to fix the problems we were constantly experiencing with our old rain barrels; leaky spigots, no overflow system,and open to the elements and insects. 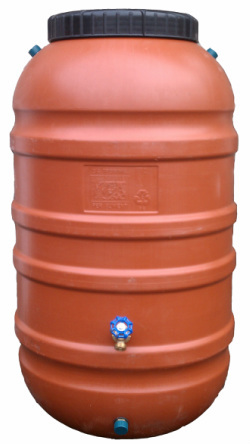 The result is a high quality affordable rain barrel. Created from recycled olive barrels and using durable, long lasting fittings, these rain barrels will maintain a clean safe supply of water for your garden for years to come. You can learn more about the great aspects of a Camels Hump Rain Barrel by visiting out Features & Benefits page. If you are interested in purchasing a rain barrel or other items please visit our Store and check our listing of Retailers for a location near you. "I love my rain barrels!! We have two, and they collect most of the water we need to water our garden plants. We simply let it fill up, and then use the spigot at the bottom to fill up our watering can and that keeps our garden healthy and happy. The barrels are well constructed, solid and durable, but still light enough to easily move around (when they're empty, of course!). We're helpting to save the planet and we save on our water bill too!" "Every home should have a Camels Hump Rain Barrel. Not only are they made locally with care from reused materials, they are attractive and easy to set-up and maintain. I have relished seeing how much water is collected from my roof and how much water I have saved in caring for my garden. A perfect gift for the avid green thumb or environmentalist"
"I like the size and how durable the barrel has been. I put it on a couple of cinder blocks to get it off the ground and its been great. The screened top is very easy to keep clean and keeps all the debris out of the barrel"